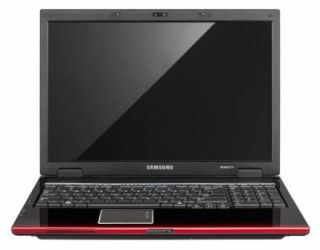 The announcement this morning of the Centrino 2 processor has prompted a gaggle of companies to show off their laptop wares, with Samsung being the latest to introduce a new range. Samsung's 'R' range of laptops consists of the R510, R560 and R710. The laptops have been given a makeover and are now in-keeping with Samsung's 'Touch of Colour' design that, according to the company, "fuses innovative style with class leading craftsmanship." The R710 is the Daddy of the pack, with a 17in monitor, high-gloss black lid and ultra durable casing. Underneath the stylish chassis is, obviously, the Centrino 2 processor, DDR3 system memory and nVIDIA's powerful GeForce 9300/9600 graphics card. The OS is Windows Vista, while there's an integrated digital motion camera and wireless LAN also included. There's even the option of having BD-Rom drive installed but this does not come as standard. The rest of the range house varying specs and smaller screen sizes. The R510 has a 15.4in screen and utilises an Intel X4500 graphics core; the R560 clocks in at just 2.7kg, also houses a 15.4in screen but is aimed at gamers and designers, so its graphics card is the more-powerful GeForce 9600M GS. The R510, R560 and R710 will be available from August and will cost from £499.